David and Becki Thompson are Alliance MKs who grew up in Asia, David in Cambodia and Becki in Vietnam, where both attended the Dalat School. When they were teenagers they both heard God’s call to medical missions. In 1963, Becki’s father was kidnapped by the Viet Cong and was never seen or heard from again. In 1968, David’s parents were martyred in Banmethuot during the infamous Tet Offensive. At the time, David was a pre-med student at Geneva College. These traumatic experiences deeply challenged David & Becki’s faith and call to missions. They married in 1971. In 1975, the Alliance appointed Dave and Becki to serve in Bongolo, Gabon. They were asked to turn a dispensary into a full-service health care facility that could provide medical services to the southwest region of Gabon, an impoverished region that had only primitive medical services and recurring epidemics of measles, pertussis, and polio, on top of endemic malaria. After language studies in France, the arrived in Gabon in 1977. Over the next 38 years, Dave and Becki and an outstanding team of Alliance nurses and doctors helped turn the Bongolo Dispensary into a 100 bed, full-service hospital that proclaimed the gospel to thousands of people every year. Becki helped establish a nursing school that would eventually graduate more than 250 discipled nurses. Between 1994 and 2012, the testimony of these nurses, coupled with the faithful work of national Alliance chaplains, resulted in more than 25,000 conversions and multiple church plants. By 1994, because David was the only surgeon in an area the size of West Virginia he was working 100 hours a week. Desperate for help, he begged God to send other surgeons to help. He prayed for more than a year, and one morning, God answered him with just three words: “You train them!” Every time David prayed for help God gave him the same answer. Finally certain of God’s leading, in 1996 he recruited other missionary and academic surgeons to join in an effort to establish formal general surgery residency programs at Christian hospitals in Africa, including Bongolo Hospital. The group established the Pan-African Academy of Christian Surgeons (PAACS) that year with a faith goal of training and discipling 100 African surgeons by 2020. PAACS eventually grew to include 15 training programs in 9 African countries, with a budget this year of 2 million dollars, and has become a great coalition of Christian hospitals and NGO’s. As it stands now, PAACS will graduate its 120th surgeon in 2020. 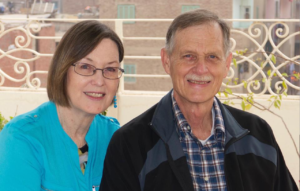 In October, 2012, Dave and Becki received a clear call from the Lord to leave Bongolo and relocate to Egypt to open a new PAACS training program and a nursing school. The call came from the Anglican Archbishop of North Africa, and the hospital was in Egypt’s Nile delta. With the Alliance’s approval, Dave & Becki moved to Cairo in January, 2013 and studied Arabic for nine months. They moved to Harpur Memorial Hospital in the Nile delta 75 kilometers north of Cairo in late 2013 and served there until the end of 2017. With God’s help, they were able to open a new PAACS training program and a nursing school. David and Becki retired from the Alliance on July 31, 2018 and have settled in Redding, California, close to two of their three children and three of their six grandchildren. David is the author of four published books: On Call, Beyond the Mist, The Hand on My Scalpel, and Christian Mercy: Compassion, Proclamation, and Power.